If you’ve been to fine dining establishments, you’ll probably come across seafood poached in olive oil or butter on the menu for quite an expensive price and wondered what it tastes like. Well, for starters, the seafood, be it prawns or fish such as tuna, salmon or halibut, will be perfectly cooked to just the right tender texture, seasoned and infused with rich flavours. You might assume that such techniques require a lot of culinary training and expertise, but the truth is, this can be easily done in the home kitchen! One advantage of cooking using this technique is that it’s very difficult to overcook the fish, it’s easier to control the cooking time than frying, steaming or baking the fish the traditional way. Health concious or vain people like me might be concerned that poaching in oil may sound like it would produce oil-soaked fish, but it actually seals in the juices and results in tender, moist fillets. After that, the leftover oil can be strained to be reused for extra poaching, for making salad dressings or sauces. They keep well in the fridge for up to 2 weeks. I assure you with my culinary experiences of cooking with this method that once you tried cooking seafood using this technique, you will be amazed and rewarded with succulent fresh tasting seafood. Are you ready to take this step? Step into the realms of olive oil poaching. Bought this at Hua Ho Bunut or Manggis – One of the cheapest extra virgin olive oils. I recommend this if you want to save $$$. The trick is warm, not hot oil. 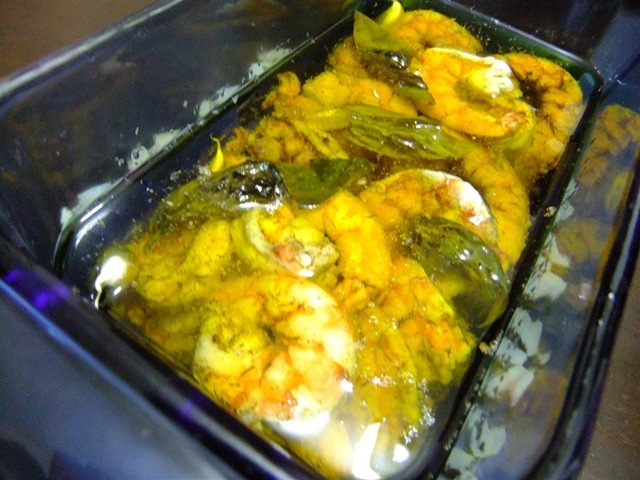 Imagine that you’re pampering the fish fillets and prawns, letting them soak in a hotspring, infusing them with herbs and spices for half an hour. The trick is to first heat the oil to a warm temperature, then use it to soak the fish, keep it in a low temperature oven for 20-25 minutes, scoop out to drain on wire rack, then serve with sauce and other condiments or eat on it’s own. Pre-heat your oven to 105 degrees Celcius. Get ready a lot of extra virgin olive oil, you should have enough to at least cover the fish fillets. For me, I always choose extra virgin olive oil that is not exposed to sunlight and as far from the expiry date as possible. Make sure it’s extra virgin, as this packs more flavour and tons healthier too! However, if you don’t want to overspend, just use normal olive oil. Try to get the freshest fish such as salmon, tuna, cod or halibut and prawns you can from the fishmonger. Fillet the fish into one inch (about 2.5cm) thickness, and for the prawns, peel and devein them. I would not use frozen fish for this dish but frozen prawns are acceptable. If you took the fish fillets straight out of the fridge, sit them at room temperature for at least 30 minutes. This is to make sure the oil temperature wouldn’t drop too much as you poach them. For frozen prawns, they will take more time. Throw a few cloves of garlic (skin not peeled) and sprigs of fresh herbs at your disposal (I usually use basil or rosemary) into your extra virgin olive oil and heat the oil up to only 60 degrees Celcius. This will be quite fast, if you overheated it, let it sit and cool till reaching 60 degrees Celcius. Use an instant read thermometer, or use an infra-red thermometer like I do. Season the fish fillets or prawns with salt, pepper, paprika and some dried herbs of your choice. You can tweak the recipe with your favourite seafood spice rubs here. I have tried using curry power or garam masala with great success as well. Arrange the fish fillets and prawns on your cooking pan or bakingware, making sure they dun overlap on each other. It must be one layer only for the fish fillets but prawns you can stack them a bit, but not too crowded as you want their surface to be exposed to the oil. Pour the 60 degrees Celcius oil onto your cooking ware until just enough to soak the fillets and prawns. Immediately put them into the 105 degree celcius oven, and bake for around 20-25 minutes. It is important to check them after 20 minutes and once you see some small whitish droplets floating around the surface of the fish or prawns, immediately scoop the fish or prawns out with a slotted spoon and drain them on a wire rack. I once made the mistake of leaving them in the oil there for an extra 5 minutes after I took them out of the oven, and compromised on the texture. 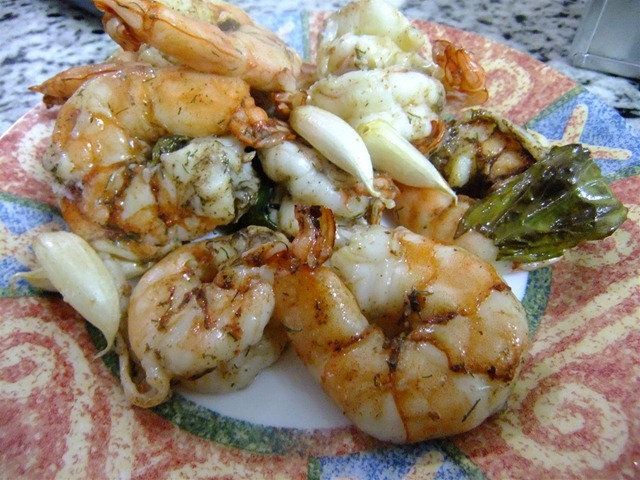 Therefore, remember to take the fish or prawns out of the oil after you see the whitish droplets. After draining the fish or prawns, savour their fresh tasting flavours on their own or serve with sauce.